Gardening Airy Fairies: Fig – Ficus ? 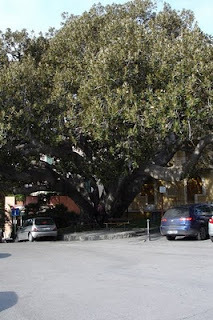 When we visited Bordighera (between Ventimiglia and San Remo) last week, we came across this wonderful tree, just to the left of the entrance to the old quarter of Bordighera. I’ve been wondering about what the tree it was ever since. I think it is some type of Ficus, there are at least 800 species which start with Ficus ........ In this case the shape was like a Banyan tree, but most Banyan trees are tropical. It could be that one of them was planted in Bordighera and survived with the mild climate. It’s obviously very old. I thought of a Magnolia grandiflora but the shape is a little different, plus the seeds are quite large on the Magnolia, with this tree the seeds were like small cherries, very much like a Banyan tree seeds, but it seems unlikely that it is this tree. If one of our readers has an idea please comment on this post. Les variétés bifères produisent une première fois sur le bois de l’année précédente, à partir de juillet. Mais l'essentiel de la récolte est fourni par les figues d'automne, du mois d’août aux premières gelées. Chez les variétés unifères : on peut tailler à n’importe quel niveau, car la production de fruits se fait sur les rameau de l’année en supprimant 1/3 a 2/3 de leur longueur. Fig trees that fruit only once every year, they produce their fruit from August onwards. You can prune the whole of the fig tree by 1/3 to 2/3 as the fruits are produced on the same year’s growth. Fig trees that crop twice a year, the first crop from July onwards is on last year's growth, and then again in autumn from August onwards till the first frost. When pruning this type of fig tree, only half of the branches are pruned by 2/3, the remaining branches the following year. So before pruning your fig trees make sure you know what type you’ve got.